Defiant Iran: President Hassan Rouhani. Iranian President Hassan Rouhani on Tuesday called the US “the leader of world terrorism” after Washington designated Iran’s Revolutionary Guard Corps (IRGC) as a “foreign terrorist organisation”. His remarks came as Atomic Energy Organization of Iran (AEOI) started the installation of IR6 centrifuges to be used in the country’s nuclear industry, the official IRNA news agency reported. “This mistake will unite Iranians and the Guards will grow more popular in Iran and in the region. America has used terrorists as a tool in the region while the Guards have fought against them from Iraq to Syria,” Rouhani said. 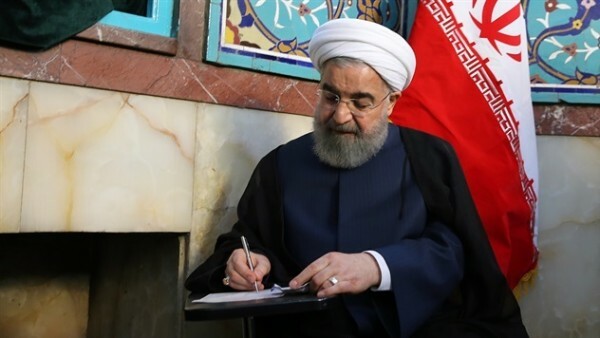 According to IRNA, the installation of a chain of 20 advanced IR6 centrifuges began in the Natanz enrichment facility in central Iran following a decree of Rouhani. “We are happy to announce the installation of the IR6 centrifuges. This will be a big achievement for the Iranian nation,” the Iranian President said, adding that with the installation of the centrifuges, subsequent tests will be carried out. Iranian Foreign Minister Javad Zarif said the US move was a “misguided election-eve gift to (Israeli Prime Minister Benjamin) Netanyahu”. Israelis voted on Tuesday to decide whether Netanyahu can win a record fifth term in office. Trump added that the move was meant to “significantly expand the scope and scale” of pressure on Iran. “If you are doing business with the IRGC, you will be bankrolling terrorism,” he said. The measure will take effect early next week, according to the US State Department. Washington-Tehran tensions have risen since US President Donald Trump withdrew from the international Iran nuclear pact. In response to the US move, Iranian government named “the US Central Command (Centcom) as a terrorist organisation and the US government as a sponsor of terror”. Defending the IRGC, Iranian Supreme Leader Ayatollah Ali Khamenei said it had confronted enemies at home and abroad, state TV reported. He said the Guards were “in the frontline of confronting enemies of our revolution and had always defended the country… America has failed to block our advancements”.